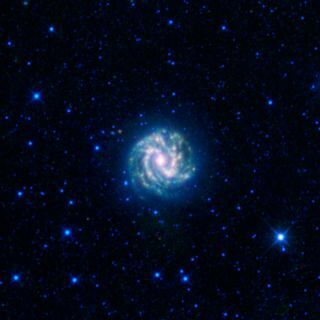 A new phototaken by a NASA space telescope has revealed the brilliant southern Pinwheel Galaxyin a new light, though it?s a cosmic half-pint when compared to our own MilkyWay. The new infraredgalaxy photo depicts the Messier 83 (M83), a spiral disc that faces up spot-onfrom 15 million light -years away in the constellation Hydra. But the galaxy isonly 55,500 light-years across. Our own Milky Way galaxy is nearly twice aswide. ?? M83 is alsoknown as the southernPinwheel Galaxy because of its location in the southern hemisphere. Anotherwell-known Pinwheel Galaxy is an object known as M101, a spiral galaxy that isvisible in the northern hemisphere in the constellation Ursa Major. Like theMilky Way, the stars, dust and gas in M83 are primarily found in the galaxy'slong, sweeping arms that twist inside a thin plane. This galactic plane is visiblebecause of M83 appears face-on when observed from Earth, rather than edgewise liketheMilky Way. ?????? Higher ratesof star formation exist in M83's arms when compared to the rest of the disksince the material and stars there are denser than elsewhere. In the new WISEimage, red light depicts very bright, short-lived stars, and green light showsdust. Both are warm emissions, in contrast to the blue and cyan-colored lightfrom most of the other stars seen. ? From thecenter protrudes a bulge of dust and stars, shaped partially shaped like a sphereand partially like a bar. The structure puts M83 the barred spiral galaxycategory, according to a WISE mission announcement.